Intermodal Dispatch Software that's easy to understand at first sight! Things have changed, the time has changed. Explore your options! that's easy to work with at first sight! Don't juggle between the screens but switch the dispatch views by clicking buttons on the same screen. 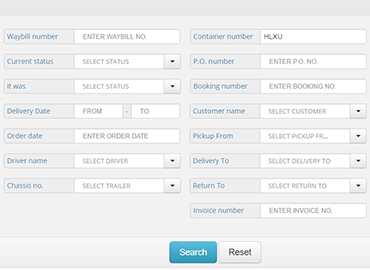 Modify any order without opening the waybill. One-click change on the dispatch screen. Keep your customers up to date on their deliveries / returns / drops with the Customer Portal for your clients. Your trucking company dispatch is linked in real-time with the Customer Portal. Dial 888-564-4638 today from 9 AM to 5 PM or chat with us! No catch, no conditions, no questions asked! No other fees! It's for real! 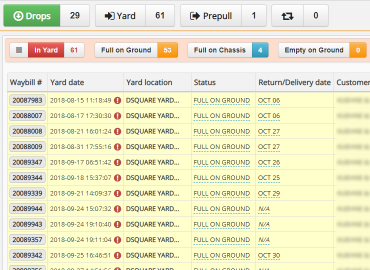 Easily manage your pending and en route orders. View available drivers, trucks & trailers. Update driver and truck/trailer & take appointment for each order. A movement is a part of the waybill route. E.g. : from customer to your yard or from your yard to customer. Add & edit movements reasons. Edit driver/truck/trailer per each movement. 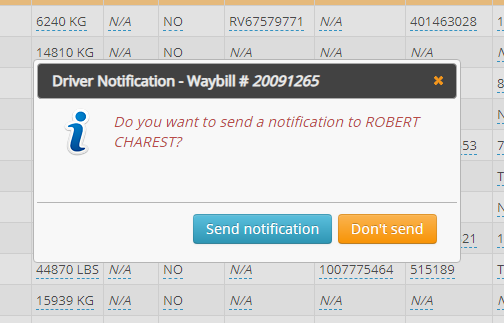 Search waybills by 14 search criteria including driver name, delivery date, P.O. number & container number. Validate Extra Accessorial Charges and Create invoices for your customers from your completed orders. Automatically send invoices by email based on customer settings and customer contacts. Keep track of your customer payments. Search your invoices by 8 search criteria including P.O. number, order number, customer name, and invoice dates. Resend PDF invoices by email in 2 clicks. Export invoices to Sage50 and Quick Books Online. 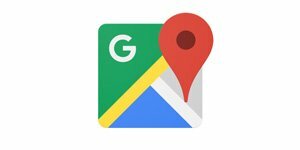 Address book for your customers, frequent route waypoints and users. Drivers, trucks, and trailers management. Express Waybill Trucking Software works for multi-office companies. Do you need to try before you buy? Do you need to show it to your partners? Here is a short Presentation of Express Waybill you may share with them. 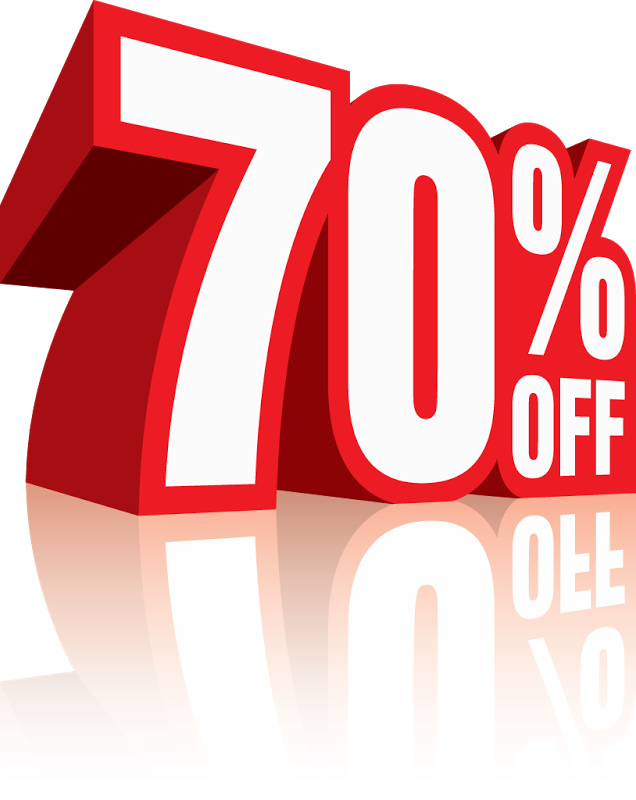 solve your operational problems, and save your money. The web-based intermodal software solution offers many ways to reduce costs, increase productivity, and strengthen your customer relationships. Many features are built right into the app to provide you with what you need to succeed. Solve your daily operational problems such as: dispatching, communication between drivers and dispatchers, find information faster when you need it. Using Express Waybill will reduce the amount of time your staff spends on researching, copying, faxing and filing documents. Save money by working paperless and your employees will work more effectively. 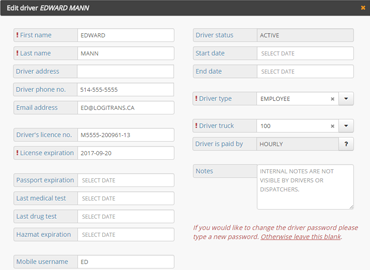 Real-time Trucking Dispatch - easily dispatch orders by appointment and their status. Prepulls, Yard and Drops management. 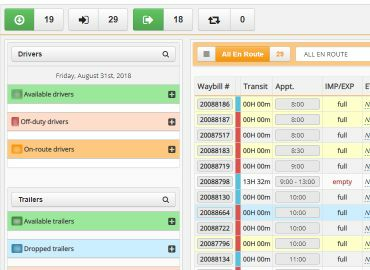 View drivers en route & trailers location. Advanced order search engine keeps orders history and allows you to search by 15 criteria such as container #, P.O. #, driver name, customer, and so on. Document manager allows you to attach documents to any order. Validate all Extra Charges (overweight, waiting time, chassis detention, storage, etc.) 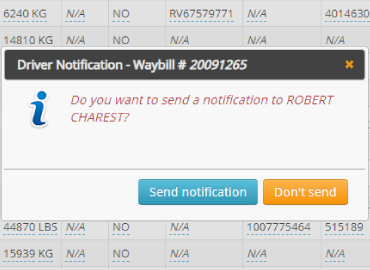 and Auto Create invoices from your delivered waybills, keep track of your customer payments. Print and Send PDF invoices by email. Keep unlimited customer contacts on hand, safe and organized. Customer contact details and your frequent routes. Document manager allows you to upload any PDF or image file. Driver license expiration & truck and trailer inspection date notifications. Store relevant documents for drivers and equipment. Bookkeeping, Profit & Loss, Container movements, Driver movements per day and Account activity reports. Custom reports available. Dispatch works independently for multiple offices. You may switch between offices (admin only). 100% Web-based application. It can be securely accessed from anywhere! 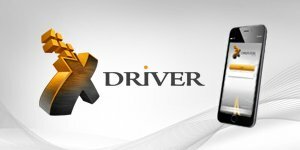 Free iPhone & Android app for drivers. Free upgrades and dedicated support. your day run smoothly and more efficiently. Display order details on driver's phone. Estimated Time of Arrival and maps. Get the client signature (P.O.D.) from driver phone to dispatcher screen (PDF & Excel) in matter of seconds. Android and iOS apps available. Plan your routes faster based on fuel consumption, distance, transit time, traffic and more. No separate commercial Google Maps license required. Posting to just two load boards? You're missing out. 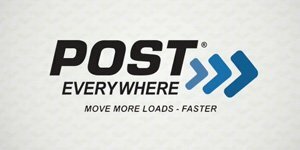 PostEverywhere instantly posts your freight to 50+ load boards from a single site. New PostEverywhere monthly paid account is required. EDI solutions with leading shipping companies, rails and accounting software. Container tracking: Get Real-time location and Estimated Time of Arrival directly from CN without logging in their website. Improve your invoicing with MSC by automatically sending (once a week) of your invoices in CSV format. Get paid faster! Real-time global track and trace environment to check the status of Panalpina consignments by container number, cargo status, etc. We can do even more and adapt the Dispatch to your existing intermodal trucking software. If you need to connect Express Waybill to your accounting software (Sage50 or QuickBooks Online) or any trucking or intermodal management system, we can do it. We can solve your dispatch operation problems and connect to any EDI partner you have. All you need is a dedicated server version of Express Waybill intermodal trucking dispatch. Every business is unique. Every client needs are unique. Express Waybill Dispatch is flexible enough to accommodate your business rules. We're proud to partner with the best in the Trucking Business. Do you need immediate help with an urgent issue? We are near you at every step. From entering your data and training your personnel to after sale free dedicated support. All our customers may find their answers browsing our user friendly documentation. How-to guides, short tutorials & videos. Our monthly subscription customers may open free support ticket. Our first-response time policy is 1 to 24 hours. Call us 24/7 for urgent issues requiring immediate attention. Service fees may apply for after hours coverage. 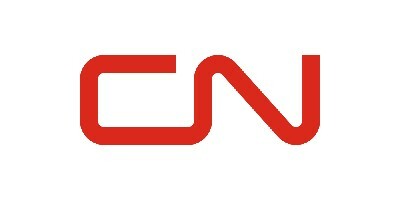 We offer on-site personnel training for Greater Montreal area (Canada) only. Our customers have free access to video chat and on-line screen sharing on AnyDesk.com or Google Hangouts. Includes on-app ticket system, on-site training and/or video remote & 24/7 emergency call number. and NOTHING ELSE. No newsletters. No offers. No spam.